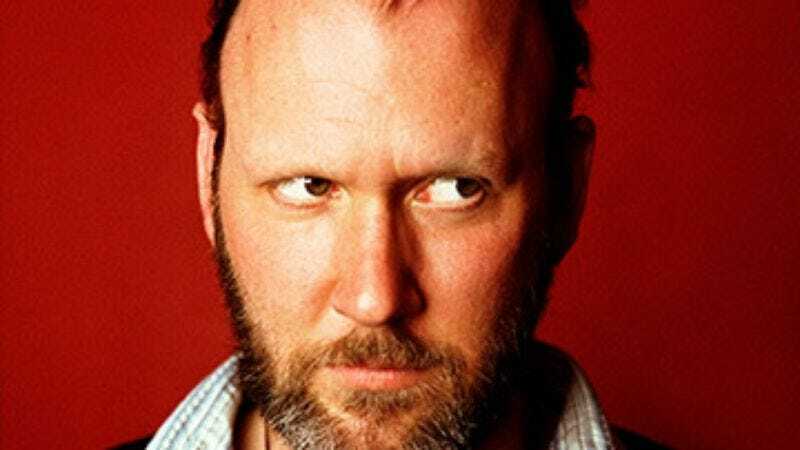 The shuffler: Eric Bachmann, singer-songwriter for '90s alt-rock hero Archers Of Loaf and '00s cult favorite Crooked Fingers. Bachmann's recent solo album, To The Races, contains evocative ballads performed with minimal instrumentation. Eric Bachmann: I'm going to China in about two weeks, with my old man and some Asian Studies professors from the University Of North Carolina. It's like a social-political-history kind of tour. We're going to Tibet, Beijing, Shanghai. I'm trying to learn how to say "Where is the restroom?" and "Sorry about my government," and "Your human-rights record is atrocious." EB: I like The Roots a lot because they play their own instruments. [Laughs.] That was the most clichéd thing I could possibly say. The A.V. Club: Do you listen to a lot of hip-hop, generally? EB: No, I don't listen to hardly any. I listen to The Roots, basically. I like stuff that's played. I hate to be a dinosaur. EB: I'm a pretty big fan. "Kathleen" is a good song. I like prostitutes, drug addicts. That song's all about that. EB: Second group of stem-changing verbs, i-r, e-r endings. Learn Spanish in your car! I lived in Guatemala this summer. I spoke Spanish for two months, and I studied Spanish a while. I'm not quite fluent. I'm fluent when I speak. I'd say I speak like an 8-year-old, or maybe a 6-year-old. But I have a hard time if people speak to me too quickly. I need to move somewhere for about eight months to a year to finally get it set in stone. AVC: Do you do a lot of traveling around the world, or are all these language lessons just a coincidence? EB: No, I like to travel. That's why I like to play music, too. But I travel outside of music almost as much as I travel because of music. AVC: What do you do when you travel? Just tour around, or live in a place for a while? EB: When I was in Guatemala, I lived in a little-bitty house and studied Spanish for two months. All I did was study. I had a tutor for seven hours a day, five days a week. Guatemala's very inexpensive. Their war ended in 1996. You know the story: U.S.-sponsored colonial government, 200,000 people killed. We don't hear about it too much, and they don't talk about it as much as perhaps they should. But basically, I just tried to soak up the culture and meet as many people as possible. Learn from them. Bob Dylan, "He Was A Friend Of Mine"
EB: Did you see that Brokeback Mountain movie? Willie Nelson did a version of this song. AVC: Have you heard The Byrds' version? EB: You know, I've been asked that about four times lately, and I hate to be ignorant, but no, I haven't. I know it exists, but I just haven't gotten around to finding it. AVC: Are you a big Dylan fan? EB: Yeah, I am. I even like the sound of his voice. All 15 different kinds of voices he uses. I like everything he did, pretty much. AVC: As a songwriter, do you compare yourself to Dylan at all, or think about Dylan when you write? EB: Me? No way. I don't think anybody could do that and be taken seriously, because he was such an anomaly in his timing and the way he marketed himself. People don't realize he was so aware of that. His songwriting was stellar. He did so many things, it wouldn't be reasonable to put yourself on that level. That's not to say I don't believe 100 percent in what I'm doing. I think that it's good. But nobody's Bob Dylan. EB: There's not much to say about that one. [Laughs.] It's pretty good. AVC: Do you find that having heard Beatles songs over and over, you have trouble really hearing them, or do they still hold up well for you? EB: Of course they do. You might get sick of the song, but you always learn stuff from the production and what the guitar sounds like… things like that. Certainly the songs are played more than you need to hear them. But I don't have a problem hearing a bunch. AVC: Tom Waits sounds like somebody who had a lot of influence on you, particularly your early Crooked Fingers albums. EB: He still does. I mean, I don't need to hear another song about a Puerto Rican midget or anything, but he's really great. EB: Okay, here we go. I'm glad that came up, because I really love that song. I got it from the Talk To Her soundtrack. Pedro Almodóvar. That's a good reason to learn Spanish. Such a beautiful song. And such a sad story. The pigeon was sending messages between the lovers, and one lover dies or something like that. I don't know what it is exactly, but it sure is sad.